If you love playing around with hardware, you’ll love Arduino. And if you don’t like hardware, you’ll love Arduino equally as much since you don’t have to be a hardware engineer to get that LED blink or program your Arduino to act as a thermometer. Arduino simply is a super quick and cheap way to have a demo or a prototype up and running in half a day. This includes having a complete hardware module, your software code flashed into it and time to make a cup of coffee to drink when you admire your creation. What do you need to get started with Arduino? 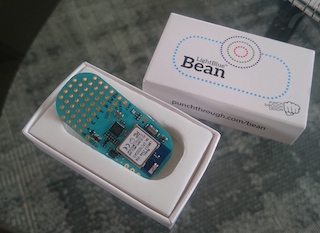 In our case, we have an Arduino compatible module called ”Bean” (www.punchthrough.com). Our module communicates wirelessly with our laptop through a Bluetooth Low Energy chip, but if your module connects through a USB cable is basically the same procedure to set up and download your code. We unpack the small match box size product box and remove the battery isolating plastic film. This powers up our module. We start by downloading and installing the Arduino programming environment on our laptop: www.arduino.cc/en/Main/Software. There are versions for both Windows, Mac and Linux. In our case we need to download the program ”Bean Loader” which will help us load our program code that we write in the Arduino programming environment to our Arduino module. We download it from here: punchthrough.com/files/bean/loader/latest.php?download. First time you open the Bean Loader, it will ask you to associate Bean Loader with your Arduino app you just installed. 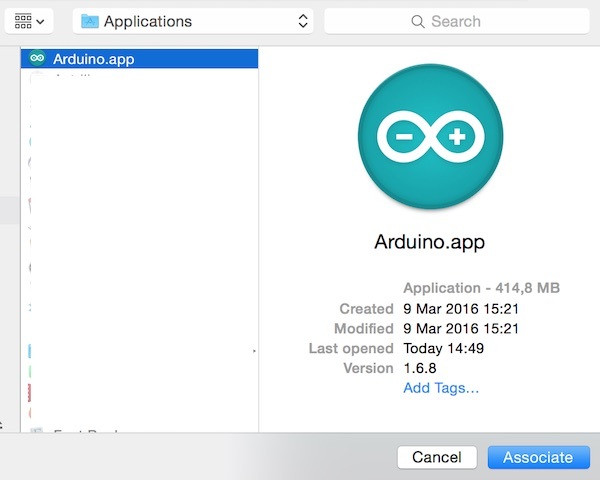 Locate the Arduino app in your Applications folder and click ”Associate”. This association will make the Arduino pass your program code to the Bean Loader in order for it to be downloaded to the module. 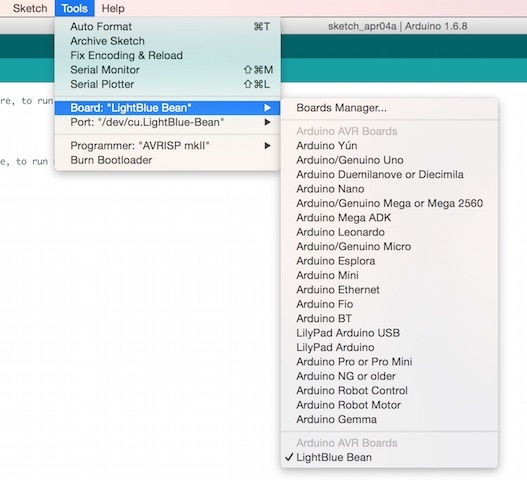 If you now restart the Arduino app, you should see the Lightblue Bean module in the list of Boards under the ”Tools” menu. 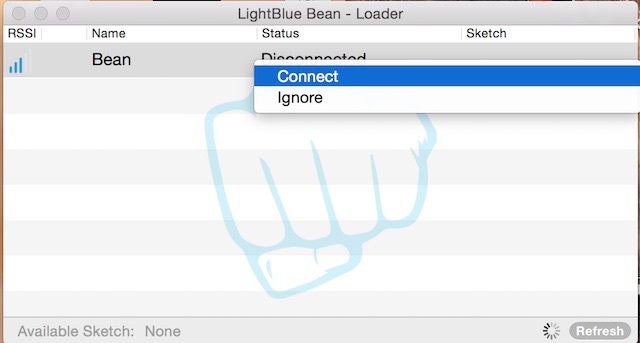 We make sure our Bean is powered on and then we start the Bean Loader app. We click refresh to find our Bean module in the list. Next we right click on it and select ”Connect”. Once connected you can try the connection by once again right clicking on the module in the list and select ”Blink LED”. 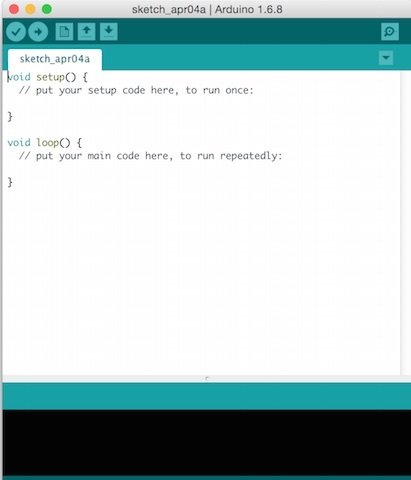 Now, everything is set up to create your first Arduino program. This we will go through in upcoming posts.